With all that in mind, we at PFF have devised a method of looking at the league’s best contracts as we enter the 2018 NFL season. We wanted to know which teams have the league’s best players under the lowest amount of guaranteed, annual money and which of those athletes had been standouts at their respective positions. To do so, we utilized our data scientists Eric Eager & George Chahrouri‘s recently revealed Wins Above Replacement metrics for every NFL player who has signed a contract after their rookie deal. Combining all of the data with PFF grades from Premium Stats 2.0, the question still remained: Which NFL players at each position produced top-level WAR values, based on the amount of guaranteed money per season and the amount of money they’ll be due after the 2018 calendar year? The formula developed was essentially that, and the results were very appealing. Are teams paying the premium for top-notch players at each position? Are there individuals who are currently outplaying their contract value? Harrison might be primarily a run defender, but the level to which he dominates the run is startling. His Wins Above Replacement average over the past three years comes in at 1.20, meaning that despite an average yearly salary of $9.25 million, he is still the best value contract among players on the defensive interior. 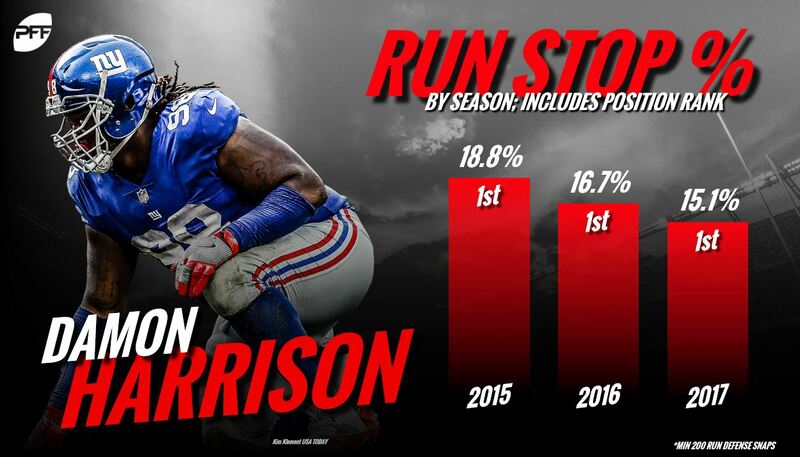 We have joked about renaming our run-stop percentage signature stat after the man known as ‘Big Snacks,’ because simply put, he owns it. Among defensive tackles with at least 200 snaps against the run, he has led the category in each of the past three seasons. Over that same span, he has ranked no lower than second in terms of PFF grade among interior defensive linemen, and that was only in 2015, where Aaron Donald just beat his grade 92.1 to 92.0. In each of the past two seasons, he has been our highest-graded run defender at the position. Daniels is a solid pass-rusher, registering 17 sacks, 22 hits and 55 hurries over the past three seasons, but he’s an even better run defender for the Packers. 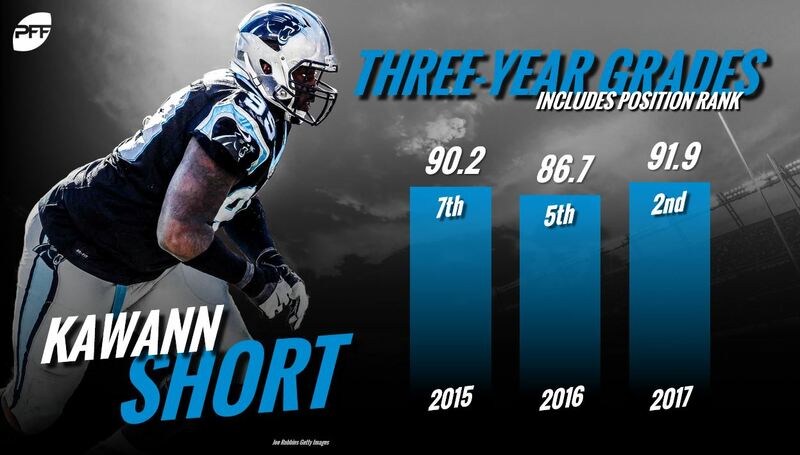 Over the past four seasons, he has produced a PFF run-defense grade of 77.7 or better in every season. In 2017, he ranked 13th among all interior defensive linemen with a 11.9 run-stop percentage, with 32 tackles resulting in a defensive stop from 269 snaps against the run in the regular season. The Packers look very good on their defensive line heading into 2018, with Daniels being joined by the ever-improving Kenny Clark, while Muhammad Wilkerson has joined on a one-year “prove-it” deal. Unrein’s deal pays him an average of just $3.5 million per year, but just $3 million of that is guaranteed. He’s unlikely to be counted on as a starter in Tampa Bay, but based on his level of play, that’s still a good value deal for the Buccaneers. Unrein was our 15th-highest graded player on the defensive interior in 2017 with a PFF grade of 85.7, and was ranked eighth among all interior defensive linemen with an 89.4 run-defense grade. Playing 195 snaps against the run for the Bears, Unrein racked up 25 tackles, with 22 of those resulting in a defensive stop. Joseph averages $12.5 million per year, but with just $11.15 million guaranteed, this was another contract that the Vikings did well with. 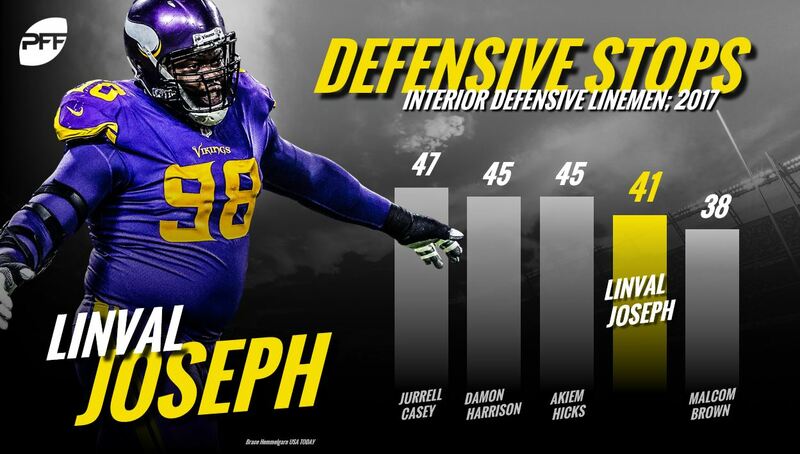 A monster against the run, Joseph ranked 12th among interior defensive linemen with a 12.1 run-stop percentage a year ago, with 35 tackles resulting in a defensive stop from 289 snaps against the run. His grade was even more impressive, ranking sixth on the defensive interior with a 90.0 overall grade and sixth again with an 89.9 run-defense grade. Joseph has produced grades of 90.0-plus in two of the past three seasons, and figures to make running on the Vikings defense tough again in 2018. Short has the biggest contract of the five players on this list, averaging $16.1 million per season with $35 million guaranteed, but he makes the list because he had a WAR average of 1.14 over the past three seasons. He’s coming off his highest-graded season in the league so far with a 91.9 overall grade, and has graded at 86.7 or higher in each of the past three seasons. He’s been a standout against the run, but also a disruptive pass-rusher with 32 sacks, 33 hits and 118 hurries over the past three seasons.